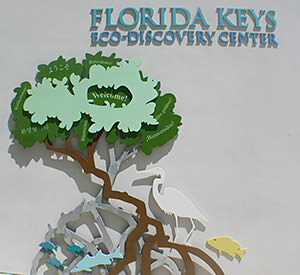 Located in the Truman Annex Waterfront by Fort Zachary Taylor, The Florida Keys Eco-Discovery Center is open Tue – Sat 9 – 4 and admission is FREE. Colorful marine artwork depicting the deep sea, coral reef and mangrove shoreline decorates the outside wall of the Center and guides the visitor toward the main entrance. Once inside, exhibits interpret the ecology of Keys’ habitats-from the upland pinelands through the hardwood hammock and beach dune, down to the mangrove shoreline, where the visitor enters the sea to learn about the seagrass flats, hardbottom, coral reef and deep shelf communities.